The partnership offers 2 million employees access to wellness podcasts they can listen to anywhere, anytime via the CoreHealth platform. As distributed via press release on July 10, 2018. Roswell, GA, July 10, 2018 –– Go Well Media is a digital media company that specializes in narrative audio wellness programs. Through a partnership with CoreHealth Technologies, a leading corporate wellness platform, Go Well programs will be available to more than 1,000 organizations around the globe – including Fortune 500 enterprises, wellness vendors, health insurers, benefits brokers, and HR consulting firms. Ready For New Wellness Podcasts? 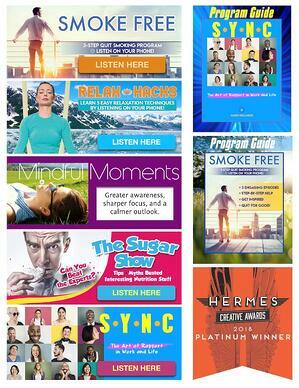 If you are interested in Go Well audio wellness programs, contact us and we'll get you started.